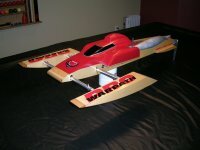 Needforspeed Hobbies is a Canadian company, owned and operated by Carmen Blois out of Sussex, New Brunswick. They are well known in the R/C boat world for their modified Zenoah engines and even more so for their tuned pipe packages. A few years ago NFS designed the popular 2" band steel pipe that has since become very popular among RC boaters around the world. Now they are adding a new pipe to the line. The new 2-stage Diffuser pipe. What's different about this pipe you ask? Well at first glance, not much really. It is the same high quality steel tuned pipe we are used to seeing from NFS. It is also designed to work with a 7/8" header. The stinger dimensions are identical at 1/2" outside diameter (O.D.) and approximately 0.425" inside diameter (I.D.). The overall length of the new pipe is also quite similar to before measuring in at approximately 16.5 inches. The O.D. of the chamber at the middle band area is 2.5 inches. ***These measurements are for the 2" band version of the pipe. The pipe is also offered in a 1" band version. The difference between this new pipe and the original version is all in the 2-stage diffuser section thus the name. The diffuser is the part between the header and the middle band section of the pipe. On the original pipe this was a single, constant angle cone. On the new pipe it is made of two different angle cones. As always, you can get the pipe as chamber only, or with water-cooled flange and your choice of 7/8" O.D. header. NFS are also well known for custom headers, so if you need a special configuration they can usually accommodate your needs! All complete systems also come with their industrial heavy-duty pipe clamp. I did most of my testing with a stock Zenoah 260 in a Zippkits Easy Vee mono. I had been running the boat with an old style 2" aluminum band pipe and decided to put the NFS 2-stage pipe on it just to see what it would do. Let me tell you I was quite surprised! The version I was testing was the 2" band version, and it seemed to really work great in conjunction with the lower exhaust timing of the stock motor. The boat absolutely lit up and performance was quite impressive for a stock engine! I then tested with a modified Zenoah 260 and it also performed quite well. I was very pleased with the performance of this pipe. Scott Schneider who was involved in the testing and R&D of this pipe has done extensive testing on both the 2" and 1" versions and here is what he had to say about it. Carmen provided me with two versions of his newly redesigned steel pipes during the winter of 07 - spring 08. First was his standard 2 inch band with the longer 2 stage diffuser section brazed on. It was a prototype using rolled cones. Early testing of the 2" band 2-stage showed promise, but it soon became very evident that with the 2-stage diffuser the overall length of pipe had increased, requiring it to be used on an even shorter header. As it was using the standard 2" band I was having the pipe clamp very near the bend in header. Using the 2-stage design on a 2" band the pipe for my application was just too long and the top end performance suffered. * But that said, the power delivery was much stronger through the mid-range with the engine actually spooling up rpm from down low much quicker. So it was a success in my opinion. Next, Carmen provided, upon my request, the SAME pipe but banded at 1". Testing resumed setting the pipe at the same length that the 2" band 2-stage was running at. Now the engine was really happy, the torque was about equal or a tad less, but the spooling up in rpm was MUCH quicker and making better top end as well. With the 1" less band on the second pipe it gave me an inch to move in shorter on the header in order to see where the limit was going to be. I never found it really. The 1" band pipe continued to make great power everywhere though a tad softer in torque. In one test, running it full short at approximately 10 1/2" mid header to end of band the 260 it was on went well into the 19000 RPM range pushing 20K. That was just ridiculous rpm to subject my engine to but proved a point that the pipe was still scavenging and boosting very efficiently running extremely short. The proportions of this new 2-stage diffuser pipe are based on R&D researched in the 1970's and in a way re-applied in 2008 taking old school thinking into the new era. I have been racing with the 1" band 2-stage pipe all summer, having it set at approximately 11 1/4" and seeing 17,500 -17,800 rpm with a great usable power band. The 2" band 2-stage pipe improves upon the standard pipe but gives up some top end because of the increased length issues. But it does spool up quicker ... hole shot special. The 1" band 2-stage pipe is one AWESOME pipe in applications where high torque is not required, but a really strong mid-range to top end punch is desirable. (Sport Hydro and Mono). * Or run a tad longer it will still pull down-low pretty well. Both Scott and I were very pleased with the performance of the new NFS 2-stage Diffuser pipe. It is a great performer and it is well made. The fact that it is offered in 1" and 2" band versions gives more options and flexibility to boaters based on their particular setups. Knowing also that you can get a steel header custom made by Needforspeed Hobbies is another plus for special applications where the standard headers won't work adequately. *Please note: unless specified differently by the customer, the production pipes are shipped "bare metal" as pictured in this article. Customers can request to have the pipe painted. If corrosion is an issue in your application, the headers and pipes can be ordered with a ceramic coating at an additional cost. As an alternative, boaters may want to try the new pipe-wrap tape from NFS. It is available in blue, yellow, red and black. For up to date pricing and availability visit the Needforspeed Hobbies website or give them a call. See below. Being that a QD is just basically an Exotic Zenoah with larger ports, The power gains the NFS pipe does for a Zenoah would translate into equal gains when used on a QD. Always looking for more power and speed. I haven't tested with a QD sorry. Can't see why it wouldn't work though.